Going for a walk the other day, I saw Black-eyed Susans blooming by the fence that surrounds a neighboring field. 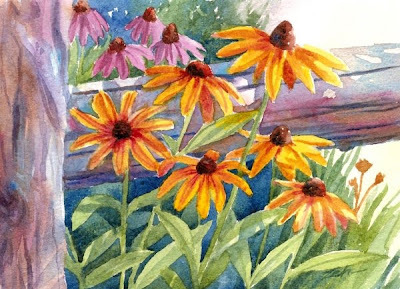 I thought some coneflowers in the background would make a nice addition. The dappled sunlight is delightful in this little scene! This painting is sold. See more of my artwork for sale on my website: zehoriginalart.com. Thanks for stopping by and have a sparkling day!